Petra has written a fascinating ‘day-to-day summary’ of their stay in Florence from Friday April 14th to Thursday April 27th, visiting their grandmother Queen Victoria at her Villa Palmieri while they stayed at the Hotel de la Ville and then leaving for Venice. Prince Albert’s favorite building in Florence was the Palazzo Pitti, the ‘beauty of the external architecture and the magnificence of the apartments’. 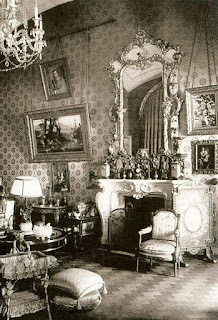 It was also a favorite for Ernest and Alix, visiting the Palazzo three times during their busy two week stay. I am curious if Queen Victoria remembered and visited Casa Cerini or had time abated her obsession of all relating to Albert. Prince Albert and his granddaughter Alix never returned to Italy but both were inspired by the architecture: Albert and Osborne, Alix and Livadia. In her book, Petra reveals that Alix bought two frames for her friend Toni Becker. There is no documentation for other purchases but I wonder if the two paintings next to the fireplace in her study in the Winter Palace were brought from Italy. In the picture below there are 2 photographs, one is of an Italian style garden and the other is of the Madonna. Can anyone identify the artists? Queen Victoria visited Florence first in 1888! Thank you very much. I did not know that. Did she visit Casa Cerini? 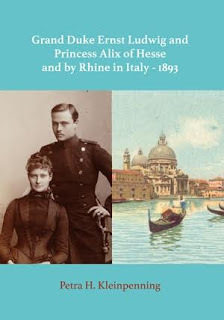 Thank you as I did love the connection of Albert/Alix with Italy and how they both never returned while Ernest did many times. I have identified quite a number of paintings in the study. But the two by the fireplace are difficult. Also the one below Serov's. Any idea? I wondered if it was a Krachkovsky.